What is the Final Sign of the End Times? Throughout this website you will see many signs showing that we are living in the end times. But is there ONE specific final sign that would tell us we are living right in the very last days just before the second coming of Christ Jesus? Yes! And on this page we will reveal that one end time sign which, once it is fulfilled, will tell us that we are right at the end of this world. Let me just confirm that we are not going to fix any dates for the end of the world, because the Bible expressely states that no man knows the day or the hour of Christ's return (Matthew 24:36). But we can know when it is near (Matthew 24:33). And from this final sign that is YET to happen, when it is fulfilled, we will know that the end is VERY near and that Jesus could return within just a few years. Many people today would say that antichrist being revealed and sitting in the temple in Israel would be the last sign. The problem with that is the fact that the main Bible antichrist (REVEALED HERE) has been revealed for hundreds of years and the temple being rebuilt in Israel has no real significance in end time Bible prophecy, which we will explain below. So what is the final sign? Christ gave this warning for two sets of people. He gave it as a final warning to the Christians of the early church and He also gave it to Christians living in the very last days. Now for the Christians living in the time of Christ, this prophecy and final warning was fulfilled in the destruction of Jerusalem in AD70. When the Christians saw the abomination (Roman army) stand in the "holy place" preparing to attack Jerusalem, it was the final sign that they were to flee to the mountains. Which many Christians did and were saved from the complete destruction of Jerusalem. Unfortunately, the Jews did not heed the warning from Christ and over 1 million of them perished! "the hour cometh, when ye shall neither in this mountain, nor yet at Jerusalem, worship the Father. Ye worship ye know not what: we know what we worship: for salvation is of the Jews. But the hour cometh, and now is, when the true worshippers shall worship the Father in spirit and in truth: for the Father seeketh such to worship him. God is a Spirit: and they that worship him must worship him in spirit and in truth." Do you see what Jesus is saying here? So many people miss this clear statement by Christ. The New Testament is very clear in it's teaching that the literal nation of Israel lost it's status as being God's special chosen nation. You can see this important truth in this study. This is the reason Jesus said the above statement, because Jerusalem would no longer be regarded as the "holy place", and the fact that it was totally destroyed also adds to that proof. Let me just further clarify this point that Jerusalem cannot be regarded as a "holy place" today. What needs to be present in a place for it to be "holy"? Is it not the presence of God that makes a place "holy"? A case in point would be Moses and the burning bush ... "put off thy shoes from off thy feet, for the place whereon thou standest is holy ground." (Exodus 3:5). Was the gound itself holy? No, it was the presence of the LORD which made it holy. Now let's apply this to Jerusalem today. Is the presence of God in Jerusalem today? No, and I will explain why. 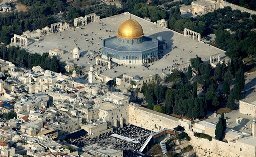 If you take a look at a picture of the "Temple Mount" in Jerusalem, you will find a building that is not dedicated to Christ Jesus. What building is it? A Muslim Mosque! Which is dedicated to their "prophet" Muhammad and their god Allah. So this place cannot be regarded as holy today when the people there clearly reject Christ Jesus as their personal Saviour. So what is regarded today as the "holy place"? God's Christian Church! Wherever people are worshipping God in spirit and truth as mentioned by Christ Jesus in John 4, THAT is regarded as a "holy place", because that is where the Spirit of Jehovah resides. Which means the professing Christian Church is where the "abomination of desolation" would take place in the last days. And what is the wrath of God which is "poured out without mixture" onto the inhabitants of the world who receive the mark of the beast? ... Revelation 15:6-7 ...'And the seven angels came out of the temple, having the seven plagues, clothed in pure and white linen, and having their breasts girded with golden girdles. And one of the four beasts gave unto the seven angels seven golden vials full of the wrath of God.' ... THE SEVEN LAST PLAGUES!! So the enforcement of the mark of the beast is the FINAL sign that will show us we are living in the very last days. And once this prophecy is fulfilled, THEN we will know that the end of all things is at hand. Many people today (probably the majority) believe that the mark of the beast is going to be a physical mark. Some say that it will be a microchip. Some say a tattoo. Others say it will be some sort of ID card. But we are not interested in what the majority of people say. We are interested in what the Word of God says in the Bible. And I will show you right from the start that the mark CANNOT be a physical mark. Why? Have a good think about this. Revelation 14 warns that anyone who receives the mark will be lost. Now if the mark is a physical one, then any government could FORCE it upon the people and therefore they would be lost even though they DID NOT CHOOSE to take the mark. And what would that make God? It would make Him to be an unfair God. But we know this is not the case. "But the word "mark" in Revelation 13 means a literal mark!" ... Yes, and so do the words "beast" and "whore" mean literal beast and whore, but we all know they are NOT literal. This issue of the mark is all down to worship, and who we give our allegiance to. Will we go along with the beast power, whether freely or under economic pressure and threat of persecution. Or will we stand true to God and His commands, no matter what pressure we are put under? This is the important point. So the final message to the world contains a warning against receiving the mark of the beast (Rev. 14:9-11), which is the final abomination that causes desolation to the inhabitants of this earth. And what does the angel say about those who DON'T take the mark of the beast (the saints)? He says they are the one's keeping the commandments of God and the faith of Jesus. Which means the mark of the beast will be a law enforced that will be contrary to at least one of God's ten commandments, which also means it is contrary to the faith of Jesus who also kept His Father's commands (John 15:10). Therefore, all we need to do is find out who the sea beast of Revelation 13 is to help us pinpoint exactly what the mark of the beast will be. If you take a look at this great study, you will find out that the beast is none other than the Papal Church of Rome. There is so much Biblical evidence that the beast and end time antichrist power is the Roman Catholic Church. Which means the mark of the beast is going to be the mark of the Roman Catholic Church. Have the Roman Catholic Church changed any of God's commandments? Oh yes! There are two in particular that they have changed. They changed the second commandment to do with idols, which is why the people of the Roman Catholic Church "venerate" (worship) idols of wood and stone. And the Catholic Church are also responsible for changing the Sabbath commandment from the 7th day to the 1st. Which is why the majority of Christianity (mistakenly) regard Sunday as the sabbath. And what is the Papal Church of Rome trying to establish into secular law and ENFORCE today? SUNDAY as a day of rest! Which is contrary to the commandments of God. Please see THIS PAGE for important information on the coming Sunday law. The enforcement of the Sunday law has happened in the past and it will happen again. There is a worldwide movement today actively seeking the governments to enforce Sunday as a day of rest. Not only is the Roman Catholic Church pushing for this. Many Protestant churches and organizations are also pushing for it. And the world is just about ripe to accept the Sunday law with all the turmoil in the economy and distress all around the world. Governments are being pressured by these churches and religious organizations to enforce the Sunday law for the sake of peace and for family unity. Which sounds good, but it is in direct opposition to the express will and command of God to keep the seventh day holy. And through this ecumenical movement today, the different denominations and faiths will unite in collectively calling for Sunday to be a day of rest. Our Creator God instituted the seventh day sabbath at creation, and then confirmed it in the ten commandments, which He wrote on stone Himself. The 4th commandment specifically states that the sabbath day is the SEVENTH day of the week, which is the day we call Saturday. But Satan has his own counterfeit "sabbath day", which is the first day of the week (Sunday). And this is the day that will be enforced by law one day soon. And once that happens, it will be the FINAL sign that we are living in the end times and the last few years of this earth's history will be upon us. Keep watch my friends. Learn the truth about the Bible sabbath. And when the mark of the beast is enforced, know that the final signs of the end times have been fulfilled.